Bonnie, one of the owners of Manistee Farms, contacted us a couple of months ago asking for help creating a website. They already had a customer base but wanted to try and branch out to selling online for a wider customer base. We provided Bonnie our itemized estimate for the website based on what they needed and she was ready to get started on the site right away. About a week later, we were supplied the info to get started on the site. We had the initial work done within 48 hours of this being received. A couple more weeks of small changes and product additions occurred. Bonnie notes that there are most likely a few more products that needs added to the site, but we were ready to launch the site and get it ‘open for business’. 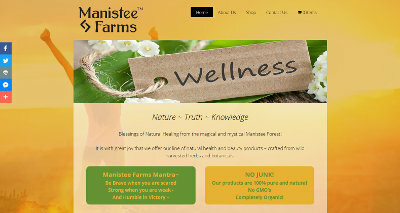 The website is at manisteefarms.com.